Tomorrow at the same time I will be sitting in a crêperie, in a tiny village in the north of Bretagne, the birth place of French crêpes. I spent time planning all the wonderful restaurants for our holiday trip in Brittany, and as you can imagine, crêpes and savory galettes are on all the menus. No wonder I HAD to experiment with (and taste loads of) crepes recipes lately! 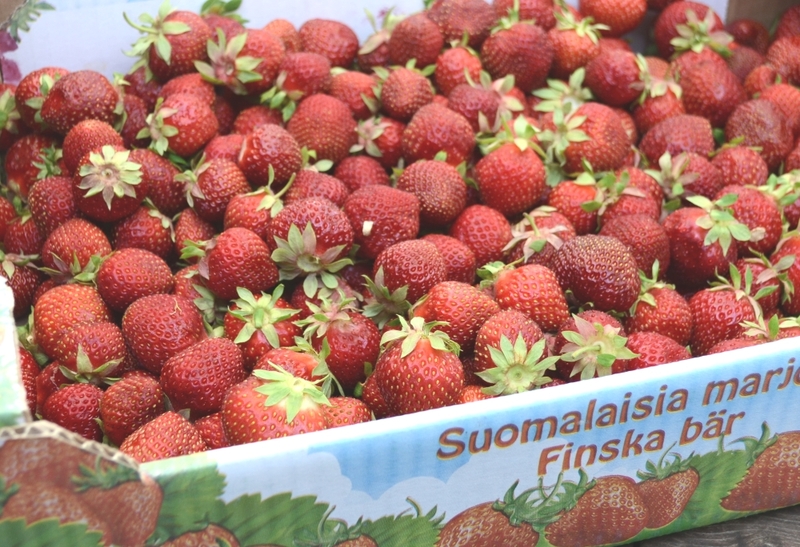 At the same time, the markets here in Finland are now filled with crates of freshly picked strawberries. Finnish strawberries are so aromatic and sweet, I couldn’t help buying ten kilos, which mostly went to my freezer, to enjoy during the dark winter months. French crepes…. Finnish strawberries… Look no further, I have the perfect dessert or snack for your summer: Light and thin crepes, all gluten and dairy free, served with fresh strawberries marinated in a lime, vanilla and rum syrup. How does it sound? I have seen crepe recipes where a blender is used to ‘get rid of lumps’, please leave the blender to the amateurs. It is easy to make a batter without any lumps at first, like we do in France, if you follow couple of simple steps. Time to heat up your crepe pans and be ready to flip your crepes high in the air! (Just make sure it isn’t stuck to the pan first). 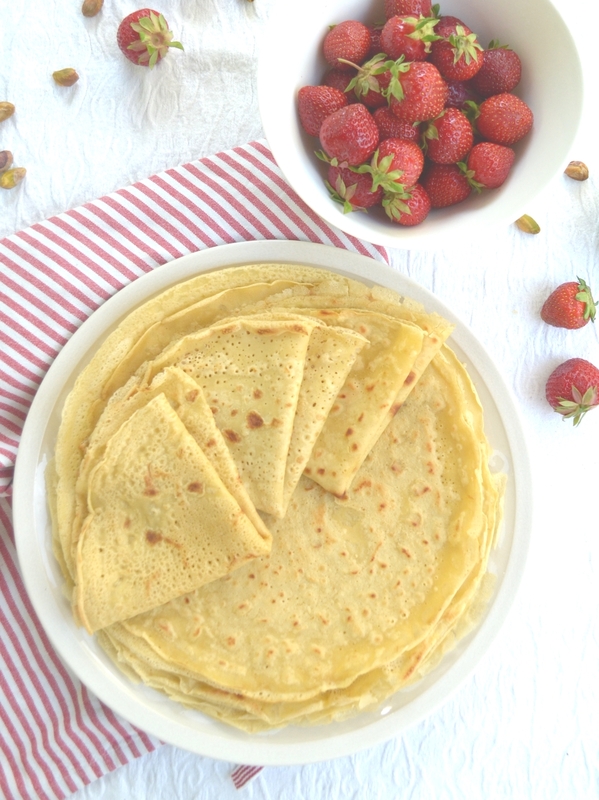 Light and thin gluten and dairy free French crepes, served with an aromatic strawberries and lime salad… The perfect dessert or snack for your summer! Start preparing the crepe batter: In a large bowl, mix the flours (brown rice, almond powder, tapioca and corn starch), sugar and salt together. Make a well and add the eggs lightly beaten with a fork. With a whisk or hand mixer, incorporate slowly the flour: let it come into the egg mixture, resist the urge to scrape the edges. Add progressively the oil and almond milk, and continue incorporating the flour until you get a smooth batter and no dry flour shows. Add the vanilla extract and the rum. Let the batter rest about one hour. In the meanwhile, prepare the strawberry lime salad: Place the strawberries in a bowl, sprinkle with ½ lime juice, the lime zest, sugar and rum. Mix well and let macerate in the refrigerator for about one hour. Cook the crepes: Give the batter a good stir before using it. Heat a crepe pan or large skillet over a medium-high heat. Spread a tiny bit of oil (or ghee butter) and rub it all over the pan. Using a ladle, pour a thin layer of batter in the hot pan, lifting it from the stove. Quickly rotate and tilt the pan with your wrist in a circular motion, until the pan is evenly covered, and put it back on the stove. When the edges start to lift and there is no liquid anymore, flip the crepe to the other side and let it cook till it is golden. To flip the crepe, use a spatula or even better, flip it high in the air with a flick of your wrist! Transfer it to a plate. Repeat with the remaining batter. You don’t need to oil the pan for every crepe. 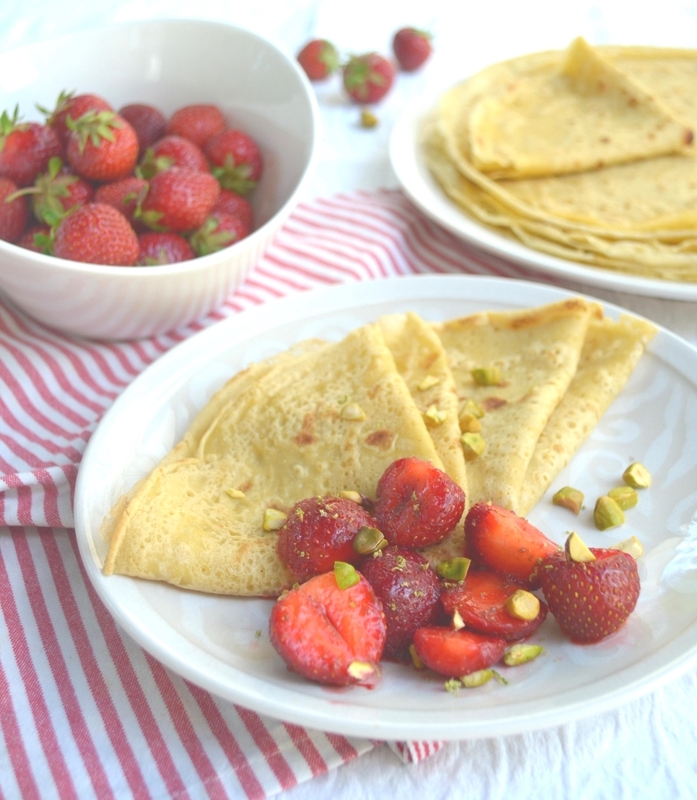 Serve the strawberry lime salad together with the crepes, and sprinkle with chopped pistachios. The first crepe is often a miss, which means the heat has not had time to spread properly across the entire pan. It is the cook privilege to eat it! Because of gluten free flour, the crepes tend to get dry the next day. Rather keep part of the batter in the refrigerator and make fresh ones the next day, if you think there is too much batter for one time use (I bet there won’t be any leftover though). 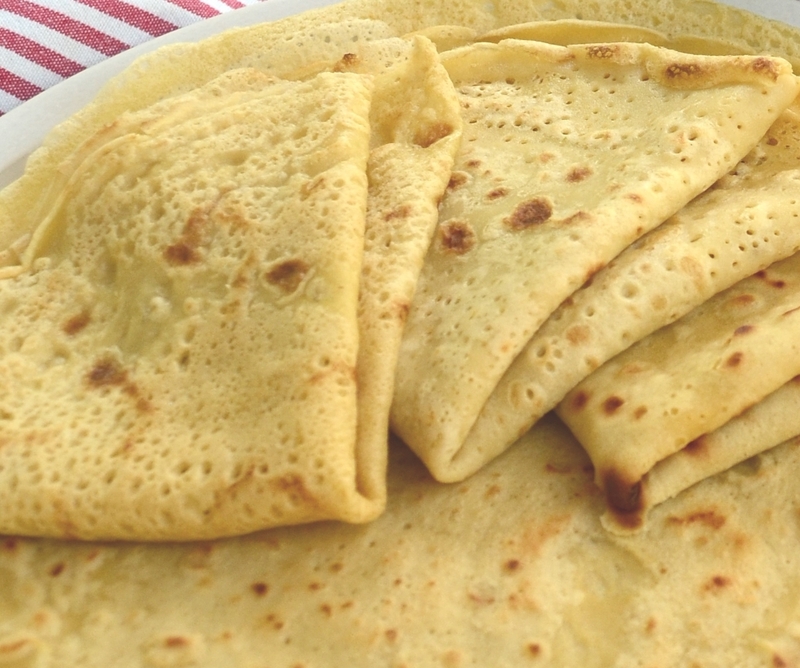 Ici on aime les crêpes et on en fait chaque semaine! Tu utilises pas mal la farine de riz, je la retrouve dans d’autres de tes recettes, par contre tapioca c’est quoi? J’hésite à acheter des farines dont je ne sais me servir… :/ J’ai tout de même bien envie d’essayer ta recette.